Are Sagarika Ghose’s views on liberalism evolving? 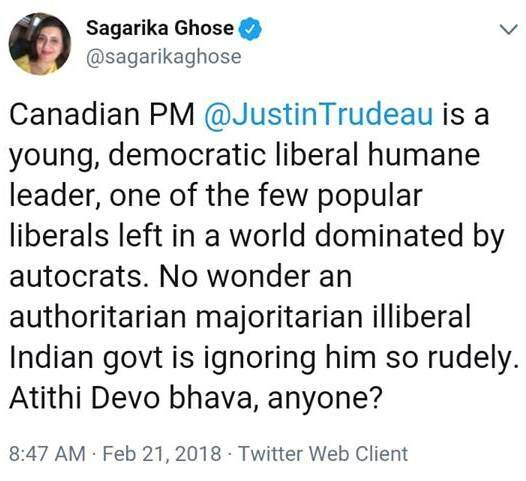 I chanced upon Sagarika Ghose’s ideas sporadically over the years, but did not particularly pay attention since no one had suggested she is a liberal. But upon reading her April 2018 articles on Kathau incident (this and this) I decided to spend a bit of time to explore her views. I guess there is a sense in which Nehru could be called liberal – but only in a very partial sense. But, of course, “even” a Rajaji was far superior to Nehru in almost every way from the ideological perspective. I’ve not yet had a chance to read her book, “Why I am a liberal” but from her description of the work of Sharad Joshi, I’m fairly comfortable that she at least understands what genuine liberalism stands for. The detailed comments on the FB page cited above are quite scathing. 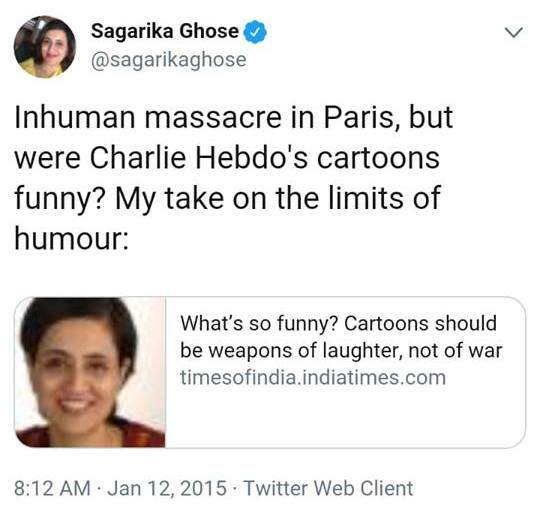 I do not agree with Sagarika’s view that cartoons are intended to be “weapons of laughter, not of war”. Who “intended” them? There is no law that says so. And can’t ever say so. In my view, a cartoonist or creator (or writer) is ALL SUPREME in his or her freedom of speech and can “use” it for whatever purpose he or she wishes. Freedom of speech means nothing if it does not include the freedom to offend. The cartoonist’s freedom must be protected at all costs – even if one disagrees with what he or she is representing. In the case of Charlie Hebdo – the topic was of of extreme significance, and I believe it is an absolute fundamental right to draw the cartoons of any religious “figure”. Religion can’t be protected from being mocked. While I don’t know much about Trudeau’s welfare socialism, I agree that even if he was, he would be worthy of respect as leader of a great nation: Canada. 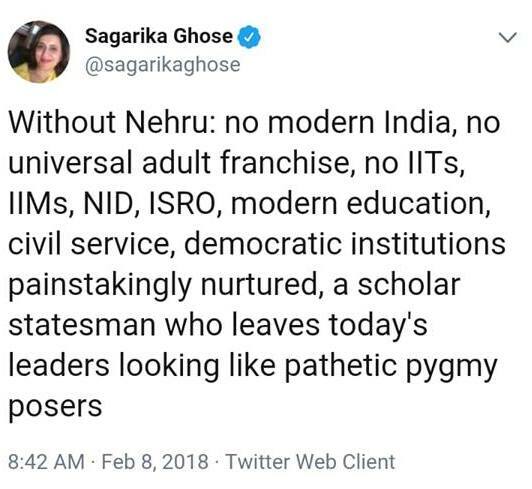 So what I’m beginning to suspect is that Sagarika is – like all of us – evolving her views incrementally, and I’ll comment further on this matter after reading her book. Finally, there is no option for the liberals of India to change the mind of a billion people. This is, in the end, an educational journey. This entry was posted in India, Liberty.